Every child is different. Every child matters. Every damaged adult was once a child. 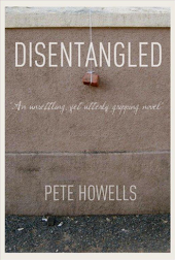 Disentangled explores what can happen to someone who is devoid of emotional intelligence. Maybe they have never been emotionally literate. Perhaps they are psychologically incapable of understanding their own feelings and have no chance of relating to the feelings of others. It is rarely, if ever, the fault of the child. What can happen when a child has a personality disorder? It can affect the way they perceive the world, the way they behave and consequently the way they are treated. If they are mal-treated, as Stringy Billy is in this unsettling fiction, the results can be catastrophic. There is an innocence about Stringy Billy that helps balance, almost equally, his guilt with a desire to put right what he deems to be wrong. As a damaged child grows up, any specialist intervention – from social workers, psychiatrists, psychologists and other professionals – tends to become, at best, more discrete. A troubled adult may receive little or no help at all. But very often the needs remain. At what point we expect a person with such complex needs to accept responsibility for their own actions is the subject of this novel. It is all too easy to blame parents, teachers or society in general. Religion may offer solutions but are these solutions relevant, are they helpful? Conversely, can atheism, humanism or modern science begin to provide any kind of explanation or cure for what can be so conveniently packaged as ‘anti-social behaviour’? Is society doomed to simply put up with the lost, the hopeless, the damaged individual – one who may wreak havoc on the lives of others? Someone like Stringy Billy. Pete Howells has drawn from over 30 years experience working with children and adolescents who find themselves isolated by what are currently termed, ‘Emotional, Social and Behavioural Difficulties’. Some he has worked with have been incarcerated for life. Others have happily gone on to lead successful and rewarding careers. In his first novel, ‘Perspective’, Howells concentrates on the potential curative effects an education can provide. ‘Disentangled’, due for release in April 2012, leaves the main protagonist,Stringy Billy, the almost impossible job of working everything out for himself. Stringy Billy knows he is damaged, he knows he is not quite right, that he has a different take on life compared to those around him. Unfortunately, the answers to his problems are not easily found. What can happen when a child has a personality disorder? At what point do we expect a person with complex personality needs to accept responsibility for their own actions? What will Stringy Billy, and people like him, do next? Should you have any queries or concerns please contact petehowells@pensup.co.uk.